Only a saint with deep spiritual experiences is qualified to write a commentary on the Yoga-Sutras or any other text of the meditative tradition. All of these texts have emerged from a Risi's state of samadhi. Only one sitting within the heights and spans of their all-transcending, all-containing horizons can hope to have a glimpse of their truths. Venerable Baba Hari Dass has been guided by the Himalayan Masters like Baba Haida Khan. He is steeped in his own Vaisnava tradition; he has kept total silence for well over five decades, while still establishing his flourishing Ashram in California where he has guided thousands of students in the spiritual path. Baba Hari Dass was born in 1923 near Almora, India. 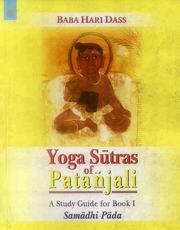 He is a silent monk and guru who classically trained in the tradition of Ashtanga Yoga. He has maintained a continual vow of silence since 1952. He and his teachings have inspired the Mount Madonna Center near Santa Cruz, California, The Salt Spring Centre in British Columbia and the Sri Ram Ashram in Haridwar, India. Baba Hari Dass was initiated into the Vairagi Vashnava order in 1942 by Baba Raghubar Dassji Maharaj, a renunciate and Sanskrit scholar.